Paul Heroux has been described as a “painter who uses clay as his canvas.” His ceramics are pleasing to both the eye and the touch, and afford a comforting impression of domesticity while still managing to thoroughly impress. A rich array of colors, patterns and textured marks render each piece singular and exciting in its own right. 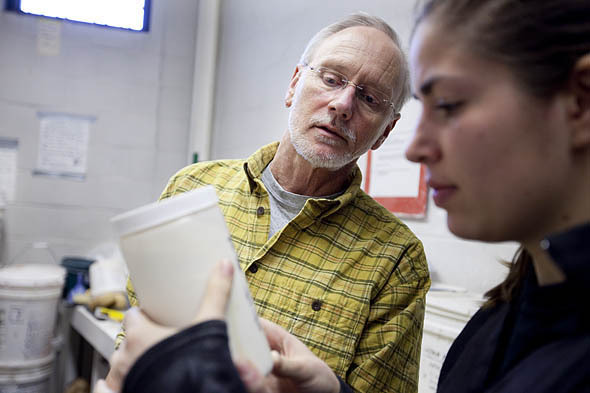 Heroux has taught ceramics at Bates for 27 years. He is one of 15 members of the Maine Crafts Association showing work in The Inspired Hand IV, an exhibition in the Atrium Gallery at the University of Southern Maine’s Lewiston-Auburn College. Also including works in wood, jewelry, fiber, book arts and mixed media , the exhibition runs until March 26. Heroux regards each of his ceramic three-dimensional forms — plates, vases and so on — “like a blank canvas without a lot of texture or marks on it.” He’ll spend one or two months making 50 to 75 forms, and then builds up glazes on them, followed by a layer of a wax solution. Once this layer is set, Heroux scratches through the wax into the glaze to make lines that he can fill in with a second glaze or a stain or color. It’s a process sometimes called “sgraffito” (the Italian word for “scratched”). Born in southern New Hampshire, New Gloucester resident Heroux has lived in Maine for 37 years. Living in the countryside for the past three decades, surrounded by white pines in a house that he built himself, has influenced his work. “The pine tree motif is in a lot of my work, in bits and pieces,” he explains. “I spend a lot of time looking at the form of the tree, the branches, and I often try to incorporate that in my work.” Indeed, when looking at his reduction-fired stoneware plate in Inspired Hand, one can decipher outlines of what could be leaves.